Hysan Hand Gel provides protection for up to 4 hours and kills 99.99% of germs and bacteria. DDAC (Didecyl dimethyl ammonium chloride), Aqua, Non-ionic surfactants, emollient and gelling agent. Apply a small amount of gel to the hands and rub in well. Allow hands to air dry to maintain residual protection. Where water and soap are available wash hands thoroughly and dry before applying Hysan Gel. How can I protect myself from germs while travelling? Consider using special travel sanitisers for hands, food surfaces and essential equipment. We offer a range of travel-friendly sanitisers that are perfect for packing on most trips. See our Hysan range. 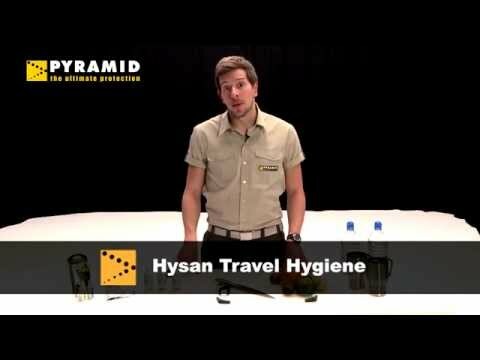 Hysan is a range of travel hygiene products designed to provide protection from germs living on our hands and food preparation surfaces. Hysan provides immediate and effective protection from 99.99% of germs in just 30 seconds. Our Hysan hand gel and Hysan surface spray work fast to remove harmful bacteria, including E-Coli and Clostridium difficile. Hysan hand gel and surface sanitiser provide protection for up to 4 hours from application. I’d like to save space, is there a one-stop washing product that I can use for everything? Yes, our multi-purpose, biodegradable Travel Soap is indispensable for travellers looking to pack light. Hugely versatile, this concentrated liquid soap can be used in salt or fresh water for washing hands, body & hair, clothes, and even the dishes! Perfect for quick and effective sanitation of any surface, the Hysan Spray kills 99.99% of germs in just 30 seconds. Use on food preparation areas and equipment, telephones and WCs. Also see our Hysan Hand Gel for clean hands when no water is available.